Who should consider a custom mouthguard? People who participate in a wide range of sports can benefit from custom mouthguards. Basically, if there’s any possibility of damaging a tooth during activity, then there’s a reason to consider a mouthguard. Football, baseball, hockey (ice/roller/field), racquetball, martial arts/boxing, basketball, power lifting, and skateboarding are all sports where a mouthguard may help prevent orofacial injury. Mouthguards are appropriate for both professional and amateur athletes. A mouthguard may be especially important for people who wear braces or have fixed bridge work. A blow to the face could damage the brackets or other fixed orthodontic appliances. A mouthguard also provides a barrier between the braces and an athlete’s cheek or lips, which will reduce the likelihood of injury to gums and cheeks. What are the benefits of an athletic mouthguard? 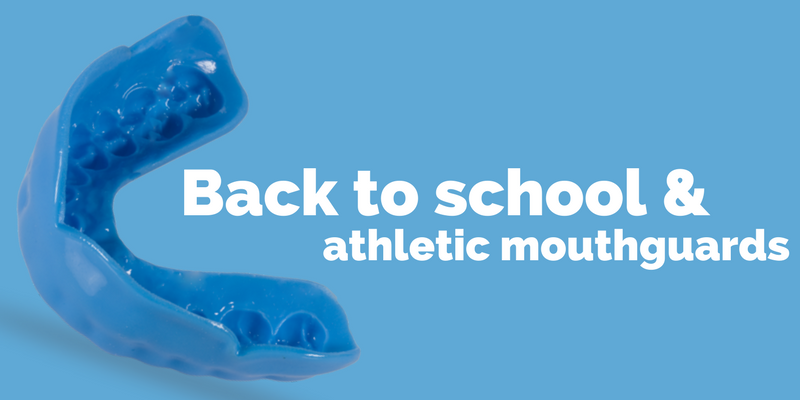 Athletic mouthguards have been shown to prevent orofacial injuries like broken, chipped, or lost teeth, fractured crowns or bridgework, lip injuries, root damage, and jaw fractures. They are also theorized to prevent concussion injuries through dissipation of forces when receiving a blow to the face. According to the American Dental Association, more than 200,000 oral injuries are prevented annually in this country by sports mouthguards. Why choose a custom mouthguard compared to a store-bought one? Most mouthguards that can be purchased in store are usable out of the package or are of the “boil-and-bite variety.” Usually, neither of these types cover the full length of teeth in the back of the mouth where extension and cushioning is crucial. Store-bought mouthguards are usually too pliable and thin to a fault, where the athlete will typically bite through them. Store-bought mouthguards also lack the retention and comfort that a custom-made mouthguard can provide, thereby causing the athlete to wear them improperly or not at all. Custom mouthguards are form fitting and fabricated to a desired thickness/flexibility depending upon the sport(s) they are needed for. They can also be custom colored! How much does an athletic mouthguard cost? A custom athletic mouthguard is $399. Mouthguards can last for years depending upon how the athlete wears and bites into them. A custom athletic mouthguard will take two appointments to make. The first appointment will last about 15 minutes. During this time, impressions of the top and bottom teeth will be taken along with a bite record. Then, we’ll send the molds to one of our dental labs where they’ll fabricate a custom mouth guard. At the next appointment, we’ll check the fit of the mouthguard to ensure it’s perfect, and give the patient instructions on how to care for their new mouthguard.